Italian sculptor, one of the foremost stuccoist of his period in Naples. He was probably trained in the workshop of the sculptor Matteo Bottigliero (active 1724-54). His first signed and dated work is the marble statue of the Dead Christ (1753) in the Sansevero Chapel in Naples. This work had originally been commissioned from the Venetian sculptor Antonio Corradini, who, on his death in 1752, left only a terracotta model. Sanmartino interpreted the model very freely and produced a work of skilful realism, which demonstrates that Sanmartino had already reached artistic maturity, and it earnt him immediate popularity in Naples, especially at the Bourbon court. 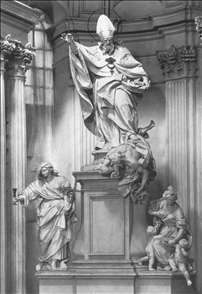 In 1757 he received another prestigious commission from the Carthusians at the Certosa di S Martino, for whom he executed allegorical marble statues of Virginity, Reward, Charity and Fortitude, four groups of cherubs and the altars of the chapels of the Assunta and S Martino in the church of the Certosa di S Martino. The tender modelling of the marble, the graceful composition and the sentimental poses, which give the allegorical figures an almost worldly look, are characteristic of Sanmartinos work. 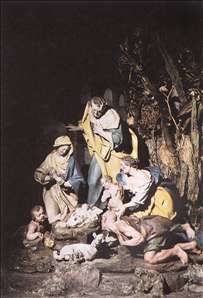 He remained faithful to this style throughout his career, even in monumental works such as the four Virtues of Charles of Bourbon (1763-64), arranged, together with ten statues of similar subjects by other sculptors, on the crowning of the hemicycle of the Foro Carolino (now Piazza Dante), in Naples. Sanmartino also designed decorative works, and his masterpiece in this genre is the main altar of the Certosa di S Martino (with two large marble figures of angels bearing candlesticks), a balustrade or low screen with polychrome marble and pietra dura inlays dividing the sanctuary from the nave, and a gilt bronze grille above it (c. 1768). Sammartino only went to Rome as a mature artist, probably before 1760; his works betray close study of the marble groups there. See more details about "Dead Christ Lying in the Shroud"